Darnall, Sugar Mill, Avonside 1740/1916 "MR BUSS"
Avonside works no 1858 built in 1920. 0-4-0T for use on 2 ft gauge. Originally delivered to J.L. Hulett & Sons Ltd for use on the Tinley Manor Sugar Estate. Later used on the Gledhow-Chakaskraal Suger Estate. Then preserved at a School in Stanger. Along with 3 other sugar loco's (Sezela no 3, an O&K and a Barclay), this Avonside was taken was taken to Dunn's in Witbank. 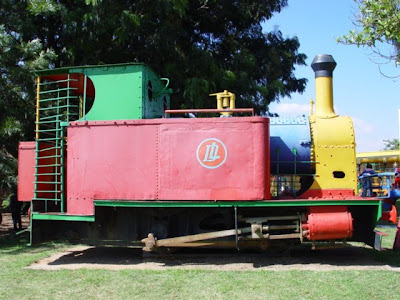 Subsequently this locomotive was painted in bright colours and donated to the Tiny Tots Nursery School in Alexander St, Witbank. 25 April 2005 photo by kind courtesy of Hannes Paling. NOTE: Go to this blog entry for more background information on the history of the Avonside Engine Company. 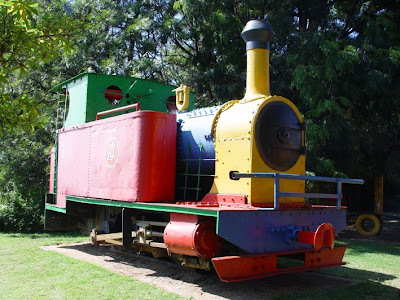 I am currently(2017) working for this school and the train is still there with it's bright colours. We are trying to get hold of the people who donated the train in hopes to find out if they knew the owner of the school.